* Senior club appearances and goals counted for the domestic league only and correct as of 4 October 2016. Oblak signed for Portuguese club Benfica at the age of 17, and was part of the team that won the domestic treble in the 2013–14 season. 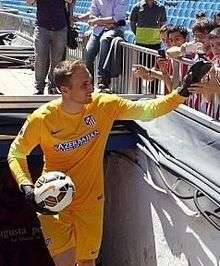 He then moved to Atlético Madrid for a fee of €16 million, becoming La Liga's most expensive goalkeeper of all time. In 2015–16 he won the Ricardo Zamora Trophy for best goalkeeper, conceding an all-time record low of 18 goals. Born in the Upper Carniolan town of Škofja Loka, Oblak started playing football at the age of five for his home town club Ločan. At the age of ten, he moved to the Olimpija youth academy, where he remained until the end of the 2004–05 season when the club was dissolved. He then moved to the newly founded Bežigrad, which, after a series of name changes, became Olimpija Ljubljana in 2008. The following year, Oblak rejected a contract from Italian club Empoli in favour of a trial at Fulham, but he eventually did not leave the club and committed his future with a contract extension until 2011. Oblak made his professional debut for Olimpija in the 2009–10 season aged 16, only missing three PrvaLiga games as the club finished fourth on the league table. On 14 June 2010, Oblak signed a contract with Portuguese club Benfica, being immediately loaned to fellow top level club Beira-Mar. He finished 2010–11 with Olhanense, totalling ten bench appearances combined. In July 2013, Oblak failed to present himself for preseason training, claiming he had no contract with Benfica. Late into the following month, he signed a contract extension until 2018, describing the situation as a "misunderstanding." After long-time starting goalkeeper Artur made a series of mistakes midway through the 2013–14 campaign, Benfica manager Jorge Jesus dropped him in favour of Oblak, and the latter went on to keep several clean sheets in his first starts, notably in a 2–0 home win against Porto and a 0–0 draw at Juventus for the semi-finals of the UEFA Europa League. He eventually won the league's Best Goalkeeper of the Year award on 6 July 2014, only conceding three goals in 13 games. On 16 July 2014, Atlético Madrid announced they had reached an agreement with Benfica for the transfer of Oblak, pending a medical examination. Atlético paid £12.6 million (€16 million) for the Slovenian player, making him the eighth-most expensive goalkeeper in football history and the most expensive in La Liga history. Oblak moved to Madrid on a six-year deal as a replacement for Thibaut Courtois, who had returned to play for his parent club Chelsea following his loan expiration. During his presentation, on 22 July, Oblak said, "I don't come to replace anyone. I come as another player. I'm here along with the rest of the players and goalkeepers. I'll do everything in my power to defend this shirt and achieve great results this season. I will do everything in my hand to help the team." Oblak was an unused substitute in his first competitive fixture on 19 August, the first leg of the 2014 Supercopa de España against Real Madrid, with Miguel Ángel Moyà playing instead. He made his debut on 16 September in a 2–3 defeat away to Olympiacos in Atlético's first Champions League group match of the season. His first clean sheet came in his first Copa del Rey match, a 3–0 win away to L'Hospitalet in the first leg of the last 32 on 3 December. On 17 March 2015, he replaced the injured Moyà in the 23rd minute of a Champions League last 16 second leg against Bayer Leverkusen, and kept a clean sheet in a 1–0 home victory. The tie went to a penalty shootout, in which he saved Leverkusen's first attempt by Hakan Çalhanoğlu in an eventual triumph. Four days later, due to the injury, he made his league debut, keeping a clean sheet in a 2–0 home win over neighbours Getafe. On 3 May 2016, Oblak saved Thomas Müller's penalty at the Allianz Arena in the second leg of the Champions League semi-finals; although Atlético lost the match 2–1, they advanced to the final on away goals. As the domestic season ended, he won the Ricardo Zamora Trophy for best goalkeeper, having conceded 18 goals in 38 games, equalling the 22-year-old record of Deportivo de La Coruña's Francisco Liaño. Oblak was first called by the Slovenia under-21 team in August 2009, replacing the injured Jan Koprivec. He made his debut 9 September of that year, against France. On 11 September 2012, Oblak made his first appearance for the senior side, starting in a 1–2 away loss against Norway for the 2014 FIFA World Cup qualifiers. He became the first-choice goalkeeper of the national team after the international retirement of Samir Handanović at the end of 2015. Oblak's older sister, Teja (born 1990), is a professional basketball player who plays for Good Angels Košice and is a member of the Slovenia national team. He is not related to the former Yugoslav international Brane Oblak, who was his coach during his time with Olimpija. ↑ "Fulham move for Olimpic Ljubljana goalkeeper Jan Oblak". Tribal Football. 17 July 2009. Retrieved 13 June 2010. ↑ Bohoric, Jure (29 July 2009). "Slovenian shuns Cottagers". Sky Sports. Retrieved 13 August 2014. ↑ "Jan Oblak rejects Fulham after trials". Tribal Football. 30 July 2009. Retrieved 13 June 2010. ↑ "Cajuda: "Oblak tem excelentes capacidades"" [Cajuda: "Oblak has great skills"] (in Portuguese). Record. 19 January 2012. Retrieved 12 March 2012. ↑ "Oblak ainda não se apresentou" [Oblak still hasn't showed up] (in Portuguese). Futebol 365. 13 July 2013. Retrieved 26 August 2013. ↑ "Jan Oblak foi reintegrado: "O Benfica é o meu clube e estou feliz"" [Jan Oblak has been reinstated: "Benfica is my club and i am happy"] (in Portuguese). S.L. Benfica. 25 August 2013. Retrieved 26 August 2013. ↑ "Oblak fecha a porta da baliza ao dragão" [Oblak closes goal to dragon] (in Portuguese). Record. 12 January 2014. Retrieved 20 January 2014. ↑ "Oblak morde os calcanhares ao melhor Artur" [Oblak bites best Artur in the heels] (in Portuguese). Record. 20 January 2014. Retrieved 20 January 2014. ↑ "Juventus 0–0 Benfica". BBC Sport. 1 May 2014. Retrieved 8 May 2014. 1 2 "Prémios da Liga: Veja quem são os vencedores" [League awards: Look who the winners are] (in Portuguese). Zerozero. 6 July 2014. Retrieved 6 July 2014. 1 2 3 4 "Atlético and Benfica reach an agreement for the transfer of Oblak". Atlético Madrid. 16 July 2014. Retrieved 16 July 2014. ↑ "Atletico Madrid agree deal for Benfica goalkeeper Jan Oblak". BBC Sport. 16 July 2014. Retrieved 29 July 2014. ↑ "Comunicado" [Announcement] (PDF) (in Portuguese). CMVM. 16 July 2014. Retrieved 16 July 2014. ↑ "El Atleti ficha al portero más caro de la historia de la Liga" [Atleti signs most expensive goalkeeper in league history] (in Spanish). Marca. 17 July 2014. Retrieved 17 July 2014. ↑ "Thibaut Courtois: Jose Mourinho says keeper will return to Chelsea". BBC Sport. 15 July 2014. Retrieved 29 July 2014. ↑ Newman, Liam (16 July 2014). "Atletico Madrid Sign Goalkeeper Jan Oblak from Benfica". Bleacher Report. Retrieved 29 July 2014. ↑ "Jan Oblak: "I'll do everything in my power to help the team"". Atlético Madrid. 22 July 2014. Retrieved 29 July 2014. ↑ "Spanish Super Copa: Real Madrid and Atletico draw 1-1 in first leg". Sky Sports News. 19 August 2014. Retrieved 20 August 2014. ↑ Wood, Graham (16 September 2014). "Olympiacos stun Atlético in five-goal thriller". UEFA. Retrieved 18 March 2015. ↑ "L'Hospitalet 0-3 Atletico Madrid: Griezmann and Gabi grind out the win". Goal.com. 3 December 2014. Retrieved 18 March 2015. ↑ Smith, Jonathan (17 March 2015). "Atl Madrid 1-0 Bayer Levkn". BBC Sport. Retrieved 18 March 2015. ↑ "El Calderón cantó a Griezmann el "cumpleaños feliz"" [The Calderón sings "Happy Birthday" to Griezmann] (in Spanish). Marca. 21 March 2015. Retrieved 12 October 2015. ↑ "Oblak relieved after Atlético edge out Bayern". UEFA. 4 May 2016. Retrieved 4 May 2016. 1 2 Farrell, Sarah (15 May 2016). "Oblak equals Liano as the best Zamora in history". Marca. Retrieved 15 May 2016. ↑ "Slovenia undone as Norway strike late". UEFA. 11 September 2012. Retrieved 6 November 2012. ↑ "Teja Oblak odhaja v Evroligo, lanska smola pozabljena" [Teja Oblak departs to the Euroleague, last season forgotten] (in Slovenian). Kosarka. 24 May 2013. Retrieved 1 May 2014. ↑ "Video: Kako trenira Teja Oblak?" [Video: How does Teja Oblak train?] (in Slovenian). Kosarka. 9 January 2014. Retrieved 1 May 2014. ↑ Rok Plestenjak (12 September 2012). "Bratje, bratranci, kapetani ... zdaj pa še Oblaki" [Brothers, cousins, captains ... now Oblaks] (in Slovenian). Siol. Retrieved 1 May 2014. ↑ "J. Oblak". Soccerway. Retrieved 10 June 2014. ↑ "Spot-on Sevilla leave Benfica dreams in tatters". UEFA. 14 May 2014. Retrieved 15 May 2014. ↑ "Una pequeña revancha" [A little revenge]. Marca (in Spanish). 22 August 2014. Retrieved 22 August 2014. Wikimedia Commons has media related to Jan Oblak.